BeerJerkNZ Beer Club beer of the week, again, and I love the new beers, this one a Tea and Flower infused affair. Never say never. A beer bottled for the club, it’s only available on tap normally. This is a 500ml bottle of a beer, with 3.8% ABV that’s about 1.5 standard drink units, and about 114 calories a serve size. Inspiration comes from many places and the brilliant Earl Grey infused Gunnamatta from Yeastie Boys is a good a place as any. 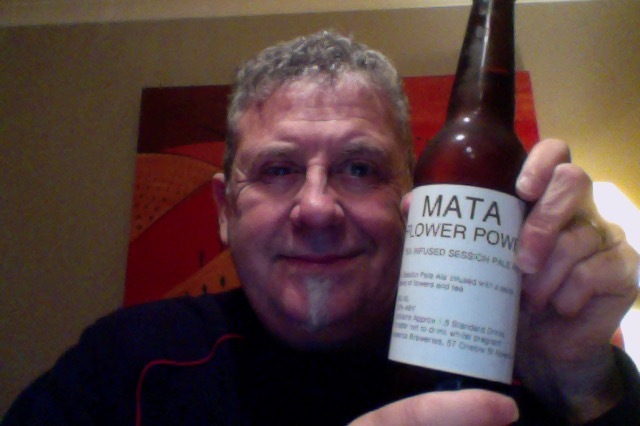 Flower Power shares a base with Mata’s Kapai Session IPA with herbal tea added in place of dry hopping. While it is brewed with hops, the tea is the real hero. Different speciality teas were trialled before landing on the perfect blend of flowers and tea. The result is a crisp and light beer with obvious tea notes and a lot of aromatic flowers. So, what could possibly go wrong? Well I’ve had a cold the last couple of days, so this might not be the ideal day to have a beer that has flavours strange in it, but what’s the worse that could happen? Lovely looking pour, glowing orange, with a really decent fluff of creamy head. Lots of lemon in the aroma for me. Taste is slightly more bitter than I thought it might be, but that’s a lovely fruit richness and a surprisingly really dry finish, Another of those full experience beers where you think you’re getting something to be dashed and given something totally the opposite. I now get a hint of lavender, and this is a beer that seems to dance on the palate, it’s clearly well thought through and delivers nice and subtle surprises. Session beer, by ABV indeed, by taste and delivery, I doubt that I could manage much more than the one, it’s surprisingly intense and bright, and attention seeking, the flavours are brilliant and different and intense and also slightly too much for me, tonight. A clever clever beer that shows what a little thinking and preparation can bring to a challenge beer, retaining many of the characteristics of the base but adding layers and hints. I’d doff my hat if I wore one. This would be a magnificent beer for a summer afternoon barbecue where company over quaffing matters, it really is quite engaging. The pdubyah-o-meter rates this as 9 of its things from the thing. Loved it mostly except I thought that it ended up just a little intense in flavours and that surprising dryness would begin to be irritating. Loved the flavours, loved that aroma even if I have not idea what some of it is, but they’re all clever, persistent, present and all doing their thing together. Result. Where did I get it? Beer Club in a bottle!, usually on on draft, never in shops. Am I enjoying it? It’s certainly memorable and I’m impressed. Would I share with a friend on a porch and set the world to rights? You know I would, this is brilliant as to where the style can go and be taken, and it’s got cachet because it’s rare as a fish on a bicycle and ever more rare now I drank my only bottle of a n extremely limited bottle run. Sometimes music from 1981 is what you need. 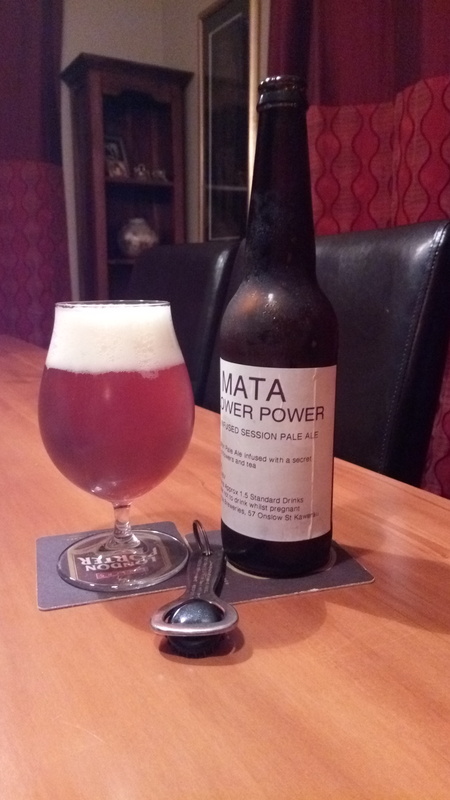 This entry was posted on July 28, 2016 by Philip Walter in Beer, Beer of New Zealand, Beer Review, Craft Beer, Critic, Justsaying, Mata, Session IPA and tagged Alcohol by volume, Aotearoa Mata, Beer, craft beer, Mata Flower Power, Pale Ale, Tea and Flower infused beer.